This is the first episode of RAW after WrestleMania 35. We witnessed some of the amazing wrestling action in the recently concluded mega event of WWE. 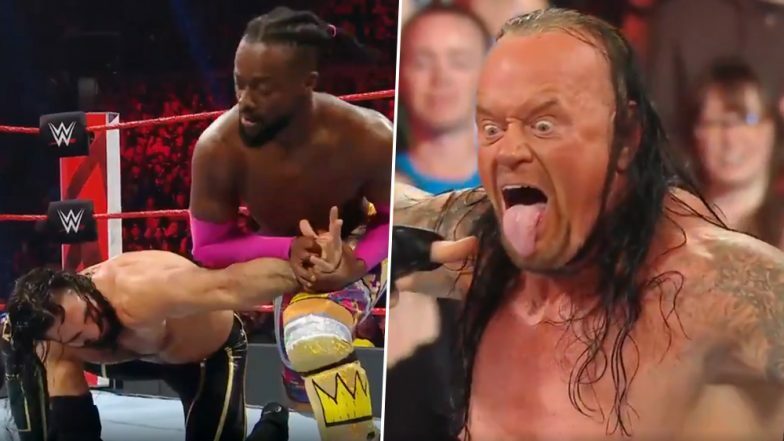 Wrestling fans have more reasons to rejoice as this past Monday Night Raw saw the appearance of The Undertaker and the battle between two world champions Seth Rollins vs Kofi Kingston. Scroll down below for results and highlights of this recently concluded show. WWE WrestleMania 35: The Man Becky Lynch Becomes the New RAW and SmackDown Women’s Champion As She Defeats Ronda Rousey and Charlotte Flair. The storyline of The Deadman Undertaker which we predicted for WrestleMania 35 took place in the Raw after Mania. Elias moment at WrestleMania 35 got spoiled by the interference of John Cena in the 'Doctor of Thuganomics' gimmick. Last night on RAW, Undertaker confronted Elias and gave him tombstone pile driver. 1. Current RAW Tag Team Champions Zack Ryder and Curt Hawkins defeated The Revival in the Tag Team Championship match. 2. Alexa Bliss defeated Bayley. 4. Current WWE Intercontinental Champion Finn Balor defeated Sami Zayn in the title match. 'The Lunatic Fringe' Ambrose does not get the farewell what he should have deserved from WWE. Instead, the former Intercontinental Champion Bobby Lashley made remarks on Ambrose wife, which lead in a brawl. Dean Ambrose was supposed to fight his last match with Lashley on RAW, however, Lashley slammed him to the announce table before the match begins. Therefore, Ambrose was left unconscious with the match getting cancelled. However, his Shield friend Roman Reigns and Seth Rollins ensured that he gets a better exit from their end. This was indeed the perfect RAW episode after WrestleMania 35, which went in proper flow with the storyline. However, WWE could have scripted better to give Dean Ambrose a proper exit by booking him in a right farewell match. The Lunatic Ambrose tribute by The Shield should have been the part of the on-air show. Click here to view the highlights of Monday Night RAW April 8, 2019.